Rated: PG-13 for intense sequences of sci-fi action, violence and destruction, and for some suggestive comments. At this point, Marvel Comics knows that people know about the Avengers. The newest movie in the Marvel Cinematic Universe doesn’t spend time establishing who everyone is with long backstories – we open with a fight sequence that gives each member of the team a chance to show off their abilities, then proceed directly onward with the story. If you haven’t seen any of the ten previous films and are willing to hold on for the ride, you can enjoy “Avengers: Age of Ultron,” but it’s going to make a lot more sense if you’ve seen at least a few. Wisely, Marvel has given the films their own continuity line – they take place in a world parallel to the ones in the comics, but not identical. (If you have some free time, Google “Marvel continuity” and check out the complex interrelationships among the various lines of comics and films.) You don’t need to have read any of the comics – but there are plenty of references and allusions for folks who have read them to enjoy. When last we saw the Avengers as a team, they’d just saved New York from a massive alien invasion and were taking a well-earned break. Now, we leap in mid-mission as they battle HYDRA forces to get back the scepter used in the New York invasion. They succeed – and Tony Stark (Robert Downey Jr.) and Bruce Banner (Mark Ruffalo) take the opportunity to analyze it and see what they can make of it before Thor (Chris Hemsworth) takes it back to his homeworld. Unfortunately, in his haste, Stark (with some reluctant help from Banner) manages to give sentience to a theoretical program to keep the world safe from future invasions. One of the first things Ultron (voiced by James Spader) does is check out the Internet, so it’s no real surprise when it concludes that the real danger to life on earth is humanity. 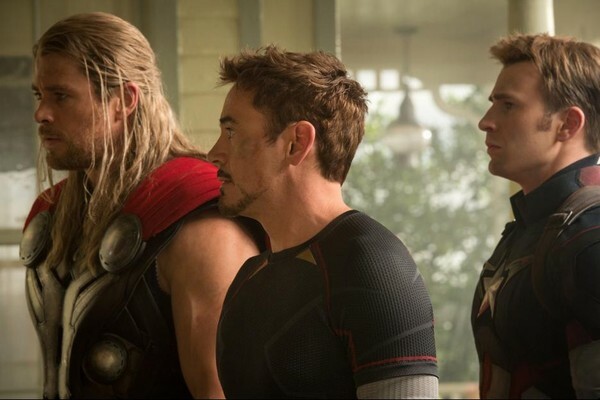 The rest of the film is the team trying to get past Stark’s actions and rebuild trust while also saving the world. This is a big-budget action movie, don’t think otherwise – there are amazing special effects, gorgeously complex fight choreography, and mass destruction – but it’s also a bunch of smaller stories about individual people with complex lives of their own. We get windows into those stories, which are spread out among all the Marvel films, and it helps to keep the characters a bit grounded. Sure, they have superpowers, supersuits, or superskills (or all three! ), but they’re also people. Another thing that helps ground the story in character is their concern for collateral damage. The Avengers spend a lot of time and energy trying to save the people caught in their crossfire. Their battles do a lot of damage, but they’re constantly trying to get people to safety, to take the battle elsewhere, to find a way for everybody to be okay. When things look their darkest, Captain America (Chris Evans) refuses to sacrifice a few hundred people to save the globe – he’s determined to find a way to save everybody, and because this is a Marvel movie, he does. The underlying optimism of the MCU films is a huge part of what makes them such fun rides – even imperfect, deeply flawed people can save the world. It’s almost impossible not to draw comparisons between Marvel’s movies and the ones DC has been putting out. Marvel’s movies are bright and colorful, DC’s are dark and gritty. Both companies have set their aesthetic and stuck to it thoroughly, which makes it a lot easier to tell in advance if you’ll like their movies. If you like Marvel’s movies, chances are good you’ll like “Avengers: Age of Ultron.” If you don’t, give it a miss.